Much of the debate on Brexit since the 2016 referendum has focused on Britain’s standing in the world. But for all the talk of international trade deals and the promised re-invigoration of the Anglosphere, Brexit is also a profoundly local issue. It’s about people’s jobs, their livelihoods and communities. That’s why we, as Labour councillors, have added our voices to the debate about what should happen if Theresa May’s Brexit deal is voted down in parliament. We know better than most how damaging Conservative austerity has been. Successive years of spending cuts have decimated many of our public services. £16bn has been cut from local authority funding since 2010. This has translated into library closures, stripped back services for young people and increased pressure on council staff. The impact on people’s lives is clear to us in our advice surgeries and daily conversations with the residents we represent. There can be no doubt that anger at austerity was a big motivating factor for many Labour supporters who voted Leave in the 2016 referendum. Yet it is equally clear that Brexit has not delivered on the promises made by the most vocal Leave campaigners. Quite the opposite: since 2016, funding has been cut even further, and the government’s attention has been consumed by negotiating the terms of the UK’s departure from the EU. All that might – just might – be understandable if the deal Theresa May brought back enjoyed widespread support and offered better terms than our current EU membership. But it does neither. Jeremy Corbyn and Labour MPs are right to be preparing to reject the deal and they have our full support ahead of the historic vote in parliament. Of course we need a general election as soon as possible. The government has given up on the future, and therefore needs to be consigned to history at the first opportunity. But an election alone will not make Brexit go away. If Labour wants to restore public spending to decent levels and bring about the transformational reforms to our economy that are so sorely needed, it has to find a way to ensure that it will not hampered by Brexit in the way the current government has been. The best way to do that is to support a People’s Vote. A People’s Vote is not a universally popular option, but it is the best course of action. The alternatives are the enfeebling compromise of Theresa May’s deal, or the disastrous spectacle of a no deal exit. As politicians have proved unable to bring about the version of Brexit sold during the referendum campaign, it is only right that people vote again, now we know what is really on offer. Labour can and should lead the call for a People’s Vote. Whether the electorate endorses May’s deal or – as we hope – chooses to remain in the EU, a new referendum will open up the political space to end the fixation on Brexit and to start bringing about the changes our country so desperately needs. If Labour leads the call for a People’s Vote and campaigns to remain, Labour will be well placed to implement its vision to reunite and transform the country. 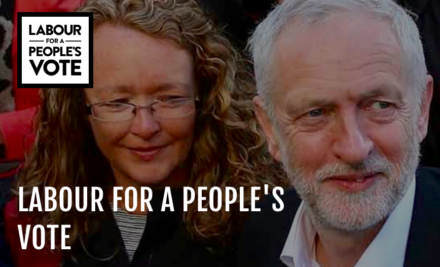 Labour councillors from Wales, Scotland and every region of England have signed our open letter to Jeremy Corbyn calling for our party to back and lead a People’s Vote. We encourage more colleagues to join us by adding their names here: labcllrs4peoplesvote.nationbuilder.com. Labour councillors are working with Labour for a People’s Vote.